Perhaps a tragedy struck, and the life of a loved one was cut short. 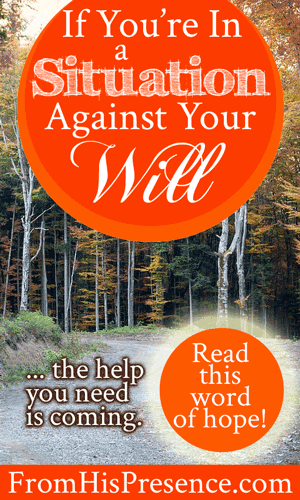 Perhaps a financial situation beyond your control wreaked devastation in your life. Perhaps a sin or violation was committed against you, and it dragged you to a place you did not wish to go–a place you never should have been forced to go. I dreamed that I was riding in a car. My mother was driving, and she drove me to a local university town, across the railroad tracks, and into a forested area at the foot of a mountain. The name of the mountain was White Oak Mountain. There was a dirt road there, which led to the top of the mountain. The mountain road had been officially closed. Traffic barricades, police tape, and other barriers were positioned across the road at the foot of the hill to prevent vehicles from using the road. Nevertheless, my mother–against my wishes and despite my vehement protests–drove around the barricades and began to drive up the mountain. As we rode, I insisted that my mother stop the car. She didn’t listen, but I knew we should not be on that road. Not only was accessing the road against the law, but it was also unfit for traffic! The road had been severely damaged by storms. In some places, there were huge bumps; in others, we had to cross large ruts and washouts. I tried repeatedly to get my mother to turn our vehicle around, but to no avail. When we arrived at the top of the mountain, there was a picnic pavilion tucked under the trees. No one should have been there since the road was closed. Nevertheless, a woman was cooking under the pavilion. She had lots of cafeteria supplies and shelving units standing all around the pavilion. Eating utensils, groceries, and more were everywhere. It looked like she was preparing to feed an army! I never saw this woman’s face. However, as my mother and I walked into the pavilion, the woman handed me a sandwich to eat. I peeked inside the sandwich and was astounded to find a vegetarian burger. (I’m a lifelong vegetarian, and sometimes vegetarian food can be hard to come by at picnics.) Then I woke up. Many of you have been taken to a place you did not wish to go. You should never have had to go there at all; you’ve only been dragged into this place because a violation of spiritual law occurred, and you’ve recognized the injustice. Throughout this journey, you’ve protested vehemently in prayer. You’ve assaulted the throne of grace, begging God to turn your situation around. However, the situation has continued on and on. Things have been hard. The road has been terribly bumpy, and your path has been hindered by storm after storm. But the Lord wants you to know today that He sees the difficult road you’ve been on. Even though it’s been hard, and even though you never should have had to journey in this place, El Shaddai–the Many-Breasted One, the Holy Spirit Himself–has been in control of your life, work, and ministry the whole time. Please know that, if your plight was triggered by sin or violation of God’s Word, God did not cause that sin. He cannot tempt anyone to sin, and He cannot cause injustice. However, no matter who caused the situation that has happened in your life, God has allowed your trial because He is going to use it. When God is ready to promote you, He always sends an enemy for you to conquer. We see this in the life of David and in many other stories throughout the pages of Scripture, and the situation you’ve been dealing with has been your enemy. However, as your Nurturer and Provider, Abba Father is right now working this situation out for your good. He’s taking you to a higher level; to a mountaintop which few people reach. He’s using your situation to get you advanced training in His spiritual university. Related: Study my series of dream and tattoo interpretations here to learn more about Biblical symbolism. But brother, sister, be encouraged: your bumpy road DOES have an end. Right now, the Holy Spirit is bringing you to the end of the bumpy road. He’s bringing you into a place of rest and shelter in which He and His angels will minister to you. And at the top of this mountain–in the very place to which you never should have had to go–Father and His angels will bring you provision that is customized uniquely to your needs. Beloved, your life and ministry are different from every other life and ministry on the planet. Only Father can bring you the provision that you need in order to carry out your purpose on earth. Such specialized provision defies the knowledge and ability of men. However, God knows exactly what you need, and His angels are cooking it up right now. And friend, I believe Abba Father wants you to know one more thing: you have been an oak of righteousness during this journey. You have walked this road in white. The enemy would like to trick you into believing that this was your fault; that you deserved this; or that your own sin caused this. Don’t believe him; the enemy is a liar. God’s Word says that you are an oak of righteousness, the planting of the Lord, and He will be glorified in your life. that they may be called trees of righteousness, the planting of the Lord, that He may be glorified” (Isaiah 61:1-3). Beloved, you’ve journeyed down a hard road. If your situation was caused by sin or violation of God’s Word, rest assured that Father didn’t cause it. However, He has allowed it for a reason. Abba Father has been in control of your life, work, and ministry the whole time. And on the mount of the Lord–in this higher place where you were brought against your will–you will receive the specialized provision you need from the God Who Sees. Does this word encourage your heart today? If so, please leave a comment below. I’d love to hear from you! This website is made possible by readers like you who partner with me each month financially, or as they can, to help me in my work of being a domestic missionary. Is Papa God calling you to help me? Find out why I need help, how you can help, and the benefits of being a financial partner here. Don’t miss a thing! Sign up for my free, online equipping program–Presence Seekers University–and get my FREE Supernatural Lifestyle Toolkit as my gift to you! May God continue to bless you with His favor! Your dream; seems to provide hope that is sure needed. Just early this morning I heard in my heart”You are giving up?” And you know I think I was. I am so tired and wonder at times if I am deserving of such mayhem that my heart was feeling defeat. I know life is not fair, but this is ridiculous! I have been prayerful, and clinching to bible scriptures to carry me through. (actually, it has been my NIV bible- God’s word, and me at the start of this long journey) It has just been a really hard and trying time of my life. You should take a look at my bible. It’s binding is broke; pages are falling out. I definitely will need a new NIV; already hinting to my sons for a new one for Christmas ;). I will fix my old one for sure and leave it on the bookshelf to retire soon. Anyways I will press on and look forward. Thank-you! I hope you decided not to quit, Lili. I know what it’s like to want to quit, that’s for sure… but may Abba Father give you grace to hang in there. No, I am not going to quit. I am going to hang on to, all of God promises! 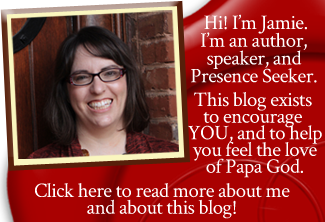 Thanks so much for your ministry; here in your blog Jamie! God Bless you in all you do! Amen to that! I agree with mu sistet lili. I to was ready to give up. Im still fighting for my marriage. Against hopeless odds. Everyone has left my side and told me to let it go. Its done and over. Lol true we have been divorced 2 years come March. But we keep trying to reconcile. The enemy has moved her from Arizona to El Paso Texas. Our comunication leeps getting less and less. Her anger and bitterness leep getting worse and her pride gets larger. But my father tells me not to believe the natrual and that all things are possible through Christ Jesus to those that love him. Its gotten day by day. The strength to get through each day. She is like a dementia patient. Somedays she remembers and is the loveing wife that I married hours sometimes minuets later shes back to the mean evil person that caused so much strife. Tjis mesaage bought much needed spiritual food to a starving soldier . Thank you. I’m praying for you, brother Tommy. Keep on loving unconditionally, and praying, brother. You can never go wrong with that, no matter what. Thanks Jamie, that is exactly what is going on in my life right now, it saddens me that a person or persons has this kind of hatred in there heart but I will keep on fighting and praying. Restore,restore. Jesus I love you. You are bigger, mightier, and more powerful than anything he does against me. I love you Jesus, and I thank you for this time in the Desert. Grow me, strengthen me, and deliver me. Very encouraging. And I love the driving dreams, they really clear up things. The best one I ever heard about was that no one was driving and that meant Jesus was. Usually, if I’m driving we’re going right away from storms and I have even dreamed of turning my cousin’s car around in middle of the road. But if people are driving me, they’re going the wrong way and I’m telling them not to. The Holy Spirit is so good to speak to us in our dreams. Amen and amen. Jamie, since I started following your blog, maybe a little over a month ago, your posts have only blessed me. Thank you for the time you prayerfully put into this blog, I pray that our Father would bless you abundantly! This post was timeously, as ever… Gives hope to a weary and battle laden heart. In some truly remarkable ways, your dream speaks to my present situation: the feeling that “this is too much; it should not be happening; but it is and somehow God is driving right on through greater and greater difficulties.” Even to the woman well equipped to feed an army, with exactly what each person needs. I’m not sure whether I am that woman, or whether someone supplying my needs is at the top of the hill. Either way, God is the provider and I am comforted by that reassurance. In two very difficult situations in the past couple of days where I was feeling crushed or very anxious, the Holy Spirit has cut through the pain and smoke to give me important insights, like a set of directions for the next step and the next. I am already seeing the fruits of those insights. That’s like a hug and a pat on the head, isn’t it? Thank you for your faithfulness, Jamie. May you be doubly blessed. Definitely a big hug and pat on the head, Laurna. I’m so glad He’s giving you those heavenly downloads. You’ve been through so much–time for a divine turnaround! May He multiply His customized provision to you super-abundantly today, in Jesus’ name. Thank you for speaking encouragement into my heart right now. Please pray for me. I’ve been overwhelmed lately and felt like giving up. I’m tired, scared, and weary in my soul, but I know God is good. Keep up the good work. I love your posts. Lori, I pray that right now, the Holy Spirit would overshadow you and you would sense His watchcare, His love, His protection, and the warmth of Father’s embrace. I pray He would comfort you, in Jesus’ name. And I pray that He would help you lift up your eyes and gaze directly into His eyes–and that you would be encouraged and uplifted by the love you find there. May He also give you wisdom to know how to rearrange your schedule so that you won’t feel overwhelmed; help you make any changes if any changes need to be made; and that He would help you to come away with Him for extra time of refreshing and renewal. May you receive times of refreshing in the presence of the Lord this day, in Jesus’ name. I will continue to pray for you, sister. This speaks directly to a situation overwhelming my emotional life. I prayed against it the entire time, but I feel that I was still wronged by someone who should have known better. I don’t believe that it was malicious and intentional, but it wasn’t exactly integrity. I’m having to surrender my heart to the Lord daily and continually see through His lens of forgiveness. Jesus is totally speaking through you. Thank you for sharing. I tried and tried one time to convince myself that what someone did to me was all right–and I couldn’t get over it while I did. But as soon as I was like, “Lord, Your Word says this, and they didn’t do that; so that really was sin. But I choose to forgive them…” it made all the difference in the world. I pray our Abba Father would shower you with His customized provision in this situation and elevate you to a higher place than ever. This describes my life so accurately that it’s hard to read, lol. Seriously I’ve been through hardships and hell and back but I’m still alive. Things are starting to go better but it’s not always easy. But in the end, things will work well I think. I’m beyond excited about what God is doing in your life, Rafael. Beyond. He’s a good Abba who loves you so very much. You are His precious son. It’s by God’s grace that this came today. I’ve made a LOT of bad choices throughout my life and because of a sickness in my son, i blamed God for a while but that’s a lie from Satan himself. God never wants bad for us. It’s our choice. We can choose to follow the enemy and go his way, or go the Father’s way. I believe for many reasons that the Lord’s healing my son at this very moment. Words of truth He’s spoken to me. Many people would say it’s coincidence, but I no longer believe in coincidence. You can either believe and trust in the power of Jesus or say no and turn and go astray but look what happened to Jonah when He didn’t listen when God had a plan for him to carry out. He was thrown into the sea and swallowed by a big fish for 3 days. I’ve lived in torment because I wouldn’t trust God like I claimed I did back then. I’m taking my place on the mountain as God leads though now. Thank you so much for this!! I know I’ll be sharing the good news about the healing of my son soon! Oh, Jamie, thank you for always being obedient to post what the Lord reveals to you. Once again it was spot-on…just what the masses need to hear. The road you were on in your dream perfectly describes the way my life has been for several months now. I’ve tried to accept my situation as a compliment from the Lord, because He believes I’m strong enough to get through this. Nothing happens to me that hasn’t first passed by God. But on the worst of days, I feel so weak & tired from experiencing this situation that I never could have imagined would happen to me. That’s why I’m thankful for your post’s encouragement. I’m going to keep re-reading this one! Diane, I’m terribly sorry you’re going through this difficult time–but I agree with you in prayer for Abba Father to work it out for your good in amazing ways. I pray He would strengthen you today as well, and give you hope and courage; and that He would indeed provide your needs in exceeding abundance. And by the way… I’m praying into this dream over and over too! You’re definitely not alone. But I know Abba will come through for all of us. We’ve come too far to look back. Hi, Courtney. Thanks so much for reading. I completely agree that our Abba Father doesn’t cause sickness. And I know it can be hard when we don’t understand the effects of this fallen, imperfect world we live in. But I pray Papa would not only heal your son, but also comfort you, encourage you, and lift you up. That He would strengthen you and help you to believe in His complete goodness, even when times are hard. I think we all need this today. Help us, Father, in Jesus’ name. Thank you so much for re-igniting my Faith and Hope in the Lord of hosts. I always believed and knew that all bad things happen BUT they are not from our Father God. All bad things and situations had come to pass BUT his promise stands forever. This is clarified using the analogy of Abraham and his son. On the mountain; on His mountain; in the wilderness he will deliver us and give a better provision specially made for our relief. God bless you my sister for all your heartfull intercessions to my Life! Hi Ndleleni, I agree with you. I’ve also been in a difficult season, BUT GOD is still who He is, and He’s still on the throne and neither His power, nor His love, nor His goodness have been diminished one tiny bit. Praise God. Just waiting to get a room, but my money did not show up on the 1st like last month. Praying she holds it for me! Have you heard of Rick Joyner or Lance Wallnau? I sent them this thread. Have you read the book by Rick Joyner, “The Final Quest?” The top of the mountain is Gal. 2:20. Excellent book, I highly recommend it to you! This really spoke to me. My number 1 prayer to God has been a three strand cord of these requests on my behalf. 1. God please purify my heart, because the pure in heart shall see God. 2. God you are faithful to complete the work you have begun in me. 3. All things work together for our good to those who love God and are called according to HIS purpose. This really speaks to my heart. Thank you and God bless you always and forever. Amen! Hi there! Yes, I’ve heard of them. Thanks! Those are great prayers. I know it pleases Father for us to earnestly desire to become like Him and to glorify Him, as those prayers do. May He answer you speedily in every way and bless you in all things as you seek Him! Heyy Jamie, Great Word.Btw, what are those symbols next to each persons name? I’m still trying to get my new PayPal account to work. “GREATER IS HE,THAT IS IN US,THAN HE THAT IS IN THE WORLD, AMEN & AMEN. Prayed according to Your Word,in Jesus name,Amen.” *\O/* Doin’ a Jig for Jesus❗? I have been attached repeatedly by the enemy this past year. For so long I did think it was my doing. Then God put others in my path who were experiencing the same. We all thought we were in it alone and we’re internalizing our situation. Now I know it’s only the enemy trying to win this battle. I refuse to let him. I know where my power comes from, Jesus Christ. I let the enemy know too! My good news – We win the war! My God is bigger than anything this world has. I will overcome. You’re article has encouraged me to keep fighting and not give up! Jamie..well you know my story… This is me! the encouragement you give me!! Thank you! Thank You! Thank You!! this was a word in due season God bless you!! He has seen, He knows!! thank you Father !! !